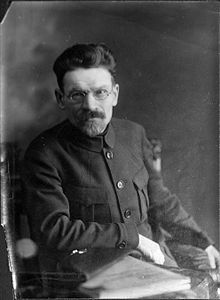 Mikhail Ivanovich Kalinin (November 19 [O.S. November 7] 1875 – June 3, 1946) was a Bolshevik revolutionary and the titular head of state of the Soviet Union from 1919 to 1946. Two large cities, Tver and Königsberg, were renamed in his honor; the latter has retained the name Kaliningrad after the fall of the USSR. Kalinin was honoured with a major state funeral and was buried in the Kremlin Wall Necropolis. You must remember that we persecute nobody for religion. We regard religion as an error and fight it with education. The national question is purely a peasant question...the best way to eliminate nationality is a massive factory with thousands of workers..., which like a millstone grinds up all nationalities and forges a new nationality. This nationality is the universal proletariat. The Jews will become socialist colonisers with strong fists and sharp teeth, a strong national group within the Soviet family of nations. These [traits] are first: love, love for his people, love for the working masses...Second, honesty...Third, courage...Fourth, comradely solidarity...Fifth, love for labor. Not only love but an honest attitude to labor, firmly bearing in mind that if a man lives, eats and does not work, this means that he eats someone else's labor. The contingencies of the moment may justify the omission of certain conveniences in the building of temporary accommodations. If you are called upon to govern humans, treat them humanely.